Just how cool is Houston Rockets center Dwight Howard? Consider: After torrential rains descended upon H-Town May 25 while he and his teammates were fighting the good fight against the Golden State Warriors, Howard opted to stick around and interact with fans stranded inside Toyota Center after the game. 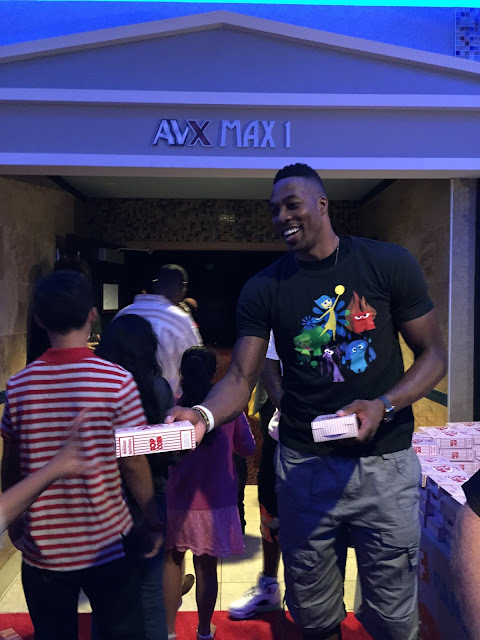 And yesterday, Howard served as genial host -- and generous popcorn dispenser -- at a special screening of Inside Out (sposnored by Fandango and Relativity Sports) for the Boys and Girls Clubs of Greater Houston. While interviewed before the screening at Santikos Palladium AVX, Howard revealed that he's an enormous fan of Pixar-produced animated features. ("I'm just a big kid trapped inside a big man's body.") Which, of course, came as no suprise to anyone who'd seen Howard waxing nostalgic about his all-time favorite movie, Pixar's Finding Nemo, as part of Fandango's "I Love Movies" on-line series. Awww, I love it when big, intimidating guys turn out to be big sweeties!